Home spas are all the rage. They create the ambiance for the perfect personal retreat. There are just two things that can keep people from purchasing a spa: the ability to install one where they live, and cost considerations. This is where an inflatable spa provides affordable luxury. If you rent your home and therefore cannot “install” a structure like a spa, inflatable ones provide all the therapeutic relaxation you need, in the privacy of your own yard. You can set one up and quickly take it down to move with you. If you don’t have room in your yard, inflatable spas are ideal to use in your sun room or basement, wherever you wish to create a retreat experience. These are very easy to set up and simple to use. They are lightweight, and come in all shapes and sizes to accommodate up to four people and a couple hundred gallons of water. If you’re on a budget and/or are unsure whether a spa itself is the right choice for you and your family, an inflatable one is a cost-effective solution that will give you the opportunity to try it out before committing to a more permanent relaxation solution. 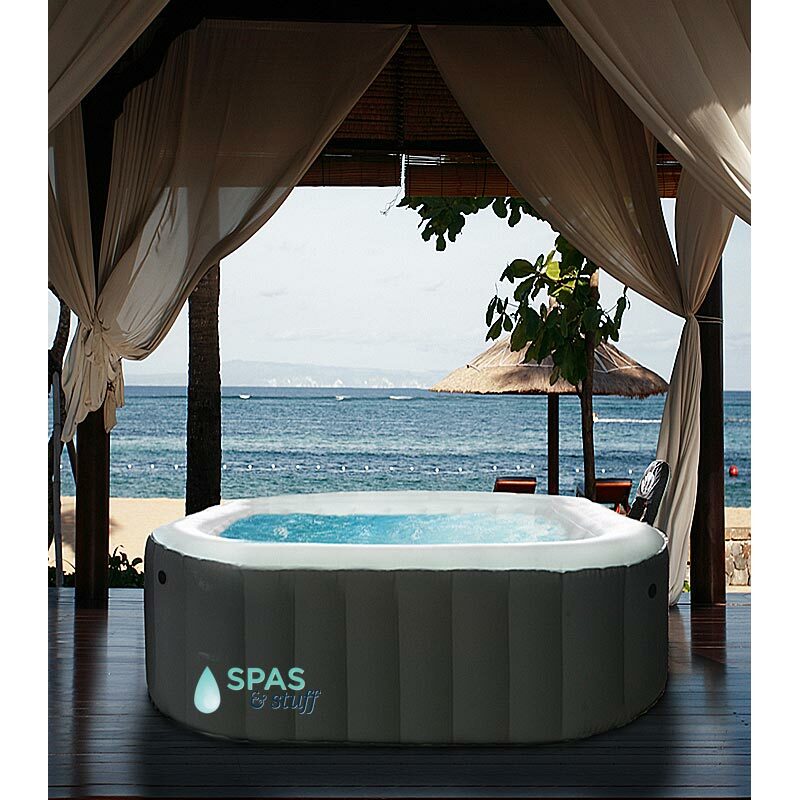 Actually, if you purchase an inflatable spa from a reputable company, you will get a good deal of use out of it for a long time, at a fraction of the cost of a deluxe spa. This entry was posted in Hot Tubs and tagged portable spas, inflatable spas on January 29, 2015 by admin. For a long time, home décor trends focused on bringing the outside in. Placement of plants that were an extension of outdoor gardens made sun rooms appear as part of the backyard. Today’s trends tend toward bringing the inside out. Elegantly upholstered outdoor furniture and stunning area rugs are transforming decks and patios like never before. Light fixtures rated for outdoor use illuminate cozy alcoves from which to read or enjoy an evening cocktail. 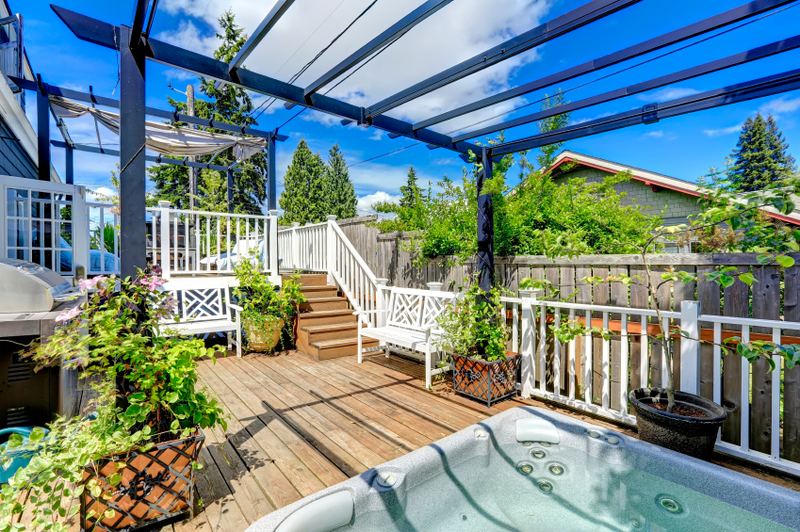 Add a little simmer of a crystal clear spa and your backyard becomes a welcome extension of your home. Regardless of where your hot tub is situated, there is an endless supply of additions you can add to showcase your own unique style. You can basically dress your hot tub as you would a favorite room in your home….so it reflects your personality. An easy and affordable way to “decorate” your spa is to frame it with potted plants – whether ferns or flowers, they will add dimension to the area – and perhaps a bit of aromatherapy! Another addition that is one of our favorites is a cantilever umbrella. Available in multiple shapes and styles, they boast rotating hubs that allow 360° They’re particularly attractive as they not only shield from sun overexposure; they add personality to the spa. Chunky pillar candles on wrought iron stands also make a statement. If you love a good DIY project, you can take recycled pieces of wood to fashion a privacy wall or a decorative screen. Depending on your level of expertise (and patience!) you can build a bench where you can sit to remove your slippers and also use as storage to stow towels. If the budget allows, an outdoor fireplace will definitely add depth of ambiance. At the end of the day, you want your home to be your refuge, your oasis. While we certainly recommend one of our hot tubs for all your relaxation needs, we think it is equally important to make it your own -- put your twist on it to personalize the experience. Send us your pictures of how you decorated your spa. We love the ideas our clients come up with! This entry was posted in Hot Tubs and tagged hot tubs, hot tub umbrellas on January 15, 2015 by admin.